Could a piping hot bowl of oatmeal be the secret to a really long life? But a single bowl in the morning isn’t enough to do the trick. "The key is that you need to get your oats at night," said Leo Donnelly, 72, the youngest of the 13 Donnelly siblings. "We've always followed Daddy's habit of that nice warm bite before sleep. Porridge at around 10 p.m., then porridge again for breakfast at 7 a.m. Cooked oats, milk, perhaps a spot of jam on top." Breakfast for a second dinner? We can usually get behind that when it involves pancakes, waffles and hash browns. But that’s A LOT of oats. “It has always stood us well, porridge before sleep and after sleep,” Leo explained. “People thought it was unusual, but now the living proof is there for all to see." Well, he’s got a point there. A combination of studies at Harvard found that people who ate two to three servings of whole grains per day reduced their risk of getting diabetes by 21 percent and also lowered their risk for inflammatory conditions like arthritis, gout, Crohn’s disease and neurodegenerative diseases, among others. A study of nurses also found that women who ate two to three servings of whole-grain products each day were 30 percent less likely to have a heart attack or die from heart disease than those who had less than one serving per week. The operative word here is “whole grain” — so those quick-cooking, sugar-laden packets won’t do the trick. Look for the least processed options available. For oatmeal, that means steel-cut oatmeal or old-fashioned oats. Whole grains also include a plethora of other options like whole wheat bread, millet, brown rice — foods that contain lots of fiber, and that are not refined or stripped of nutrients. The Donnellys grew up on a farm and, in addition to eating oats, they’ve lived a fairly healthy lifestyle which is generally free of processed foods and alcohol. "Our diet has never been from processed of polluted foods,” said Leo. "We worked with nature, everything eaten was either grown or reared by us. Mummy would say, ‘Go outside and wring a chicken's neck,’ that would be for dinner. The vegetables we ate we had grown, the fruit we ate we picked, the eggs laid were from our chickens, the bacon came from our pigs, the bread we made by hand." As children, the siblings didn't just eat fresh food — they also toiled on the farm, so they got plenty of exercise along with those oats. 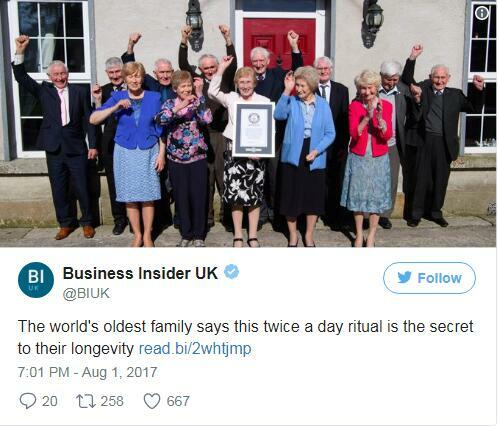 The siblings range in age from 72 to 93 years old. Their parents Peter and Ellen started the Irish family farm in 1921. The couple had 16 children, but 13 survived. Want to live a long, healthy life with your family? Do like the Donnelly siblings and eat whole grains, fresh food including fruits and vegetables, skip the alcohol and get a lot of daily activity. In other words, diet and exercise. Mind. Blown.